I’ve talked about French word nerdery, museums, amusement parks, and regular parks — and now, locks and luck. Where we stayed wasn’t far from Canal Saint-Martin, which I didn’t even know existed before this trip. What’s especially cool about the canal are the series of locks used to transport les bateaux over parts that aren’t level. Basically, the water drains and the boat is lowered level by level. Yiannis said it looked neat so we thought a boat tour on the canal would be even more so. The boat ride was nice (when is one not, given good weather), but who knew going down the locks would take so long and that there’d be so damned many of them. We thought the whole thing would take about 90 minutes, but I think it was more like three hours. The best part was when we went under this mile-long tunnel, and not just because we were out of the hot sun. Before we went on our boat tour, we had another (mis)adventure. 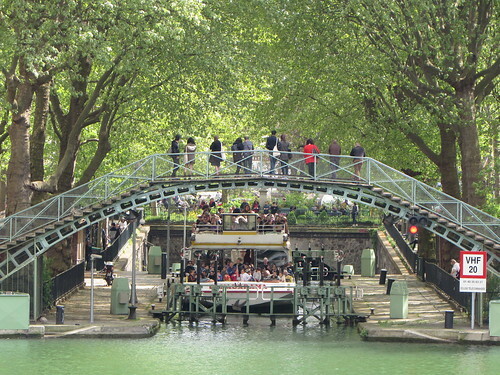 The canal boat website said that tours were given at 10:30 and 2:30. We went with the earlier option so that we’d have time to hit the Musee D’Orsay, which was the tour’s terminus. However, when we got where the tour was supposed to begin, we saw no one. No boat, no people, nothing. We asked a restaurant worker what the deal was (luckily he spoke English and was very nice) and he said as far he knew, tours were only at 2:30. You should really update your site, Paris Canal. So unfortunately we had a lot of time to kill — but that turned out to be a good thing because soon Yiannis realized one of his phones was missing. (Yes, he had two phones. I won’t get into why.) On the way, we had sat down on a bench to get our bearings. The bench was pretty far away, but Yiannis had no choice but to jog back there (did I mention it was warm and sunny?) while I waited with his stuff. Luckily I had a book. When he returned, he was unfortunately empty-handed but, to his credit, remained calm. All we could do was wait for someone to call. Until then, we decided to check out the Cité des Sciences et de l’Industrie, Europe’s largest science museum, which happened to be right nearby. But! The museum was closed. A worker told us it was for “safety reasons” but didn’t elaborate. Safety reasons? What did that mean? A terrorist threat? A bomb scare? Murder? Turns out it was a fire. I’m not sure why she just didn’t say. We headed back and got some food at the restaurant where we had asked originally about the tour. It was a beautiful day so we had a very leisurely lunch outside (burger and fries, yum! French hamburgers are really good). At one point Yiannis asked our waiter if anyone had turned in a phone, but no one had. It was so lovely and relaxing sitting there, we decided just to hang out until it was time for the tour. Luckily we did because as we were finishing, one of the restaurant workers came up to us. “I have a surprise for you,” he said to Yiannis in English. Turned out security had found his phone right outside the restaurant, and for some reason not only didn’t call the emergency contact (which was me) but had turned the phone off completely. However, we were extremely grateful to both security and the folks at the restaurant. Needless to say, for the rest of our trip, we made sure Yiannis always had both his phones. Okay I lied, I have one more post after this one, although it has only the most tenuous connection to Paris. This entry was posted on Thursday, September 10th, 2015 at 3:59 pm	and is filed under paris, paris 2015, travel. You can follow any comments to this entry through the RSS 2.0 feed. Both comments and pings are currently closed.